Successfully Added Onda V10 Pro Tablet PC - Dual OS, Android 6.0, Phoenix OS, Quad Core CPU, 4GB RAM, 10.1 Inch 2K Display, Dual Band Wi-Fi to your Shopping Cart. Dual-Band WiFi makes streaming content and working online ultra fast. Onda has just released the latest generation of the popular V10 Pro. Now you get a whopping 4GB of RAM, a 2GHz quad-core CPU and the same dual OS setup that made this tablet a hit in 2017. You can switch between the Android 6.0 or Phoenix OS - each of which offers a powerful user experience. Having 32GB of internal storage ensures you have enough space for all the essentials while the micro SD card slot brings up to 256GB of extendable storage - Plenty for games, movies and all the apps you could need. Featuring two OS systems, this Android tablet PC allows you to switch effortlessly between Android 6.0 and Phoenix OS – both of which bring along a smooth and powerful user experience that is guaranteed to meet all your demands. While based on Android the Phoenix OS adopts a windows style interface with features such as a "Start Menu" and "Task Bar". A large 10.1-inch screen delivers 2K resolutions making movies and games an immersive experience that it's simply breathtaking. A 6600mAh battery offers around 4 hours of continuous usage time or around 50 hours in standby. With OTG support and Bluetooth connectivity, you'll be able to add games controls, mouse keyboard or other peripherals to maximise the capabilities of this tablet. Now you have a portable office, games system and cinema. Like its predecessor, the 2nd Generation of the ONda V10 Pro aims to deliver the best performance for online and offline entertainments. that's why its equipped with dual-band Wi-Fi. This tablet PC also features an 8MP rear camera that's suitable for snapping pics on the go and a 2MP camera make video calls and a rewarding experience. 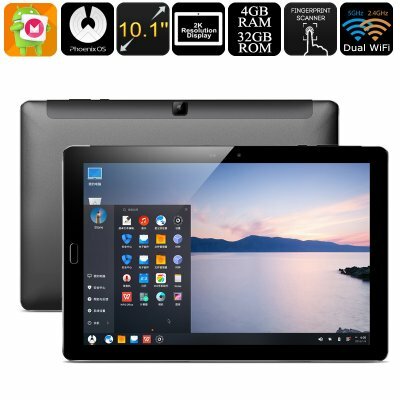 The Onda V10 Pro tablet PC comes with a 12 months warranty, brought to you by the leader in electronic devices as well as wholesale tablet computers and cool electronic gadgets..